It was really fun - lots of people working on n-categories were there. I'll talk about it next time. But as usual, more happens at a fun conference than can possibly be reported. So, this time I'll only talk about a conversation I had in a café before the conference started! Q: When the first calculus textbook was written - and in what language? A: In 1530, in Malayalam - a south Indian language! This book is called the Ganita Yuktibhasa, or "compendium of astronomical rationales". It was written by Jyesthadeva, an astronomer and mathematician from Kerala - a state on the southwest coast of India. It summarizes and explains the work of many researchers of the Kerala school, which flourished from the 1400's to the 1600's. But it's unique for its time, since it contains proofs of many results. Multiply the diameter by four. Subtract from it and add to it alternately the quotients obtained by dividing four times the diameter by the odd numbers 3, 5, etc. He used this to compute π to 11 decimal places! 5) Tom Leinster, The Euler characteristic of a category, available as math.CT/0610260. Everyone know how to measure the size of a set - by its number of elements, or "cardinality". But what's the size of a category? That's the question this paper tackles! Some categories are just sets in disguise: the "discrete" categories, whose only morphisms are identity morphisms. We'd better define the size of such a category to be the cardinality of its set of objects. where I've drawn the object but not its identity morphism. Clearly, its size should be 1.
and its size should be 2. Here we have a category with two objects and an invertible morphism between them, which I've drawn as an arrow pointing both ways. Again, I won't draw the identity morphisms. In other words, we have two objects that are isomorphic - and in a unique way. How big should this category be? More technically, we say these categories are "equivalent". We'll demand that equivalent categories have the same size. This is a powerful principle. If we didn't insist on this, we'd be insane. Now we have two objects and a morphism going just one way! This is not equivalent to a discrete category, so we need a new idea to define its size. If we were willing to make up new kinds of numbers, we could make up a new number for the size of this category. But let's suppose that this is against the rules. what do we get? The unit interval, of course! It's a pretty intuitive notion, at least in this example. into a space. So, even though these categories aren't equivalent, they give the same space. So, let's declare that they have the same size - namely, 1. In fact, let's adopt this as a new principle! We'll demand that two categories have the same size whenever they give the same space. Next, what's the size of this category? This is my feeble attempt to draw a category with two objects, and two morphisms going from the first object to the second. If we turn this category into the space, what do we get? The circle, of course! But what's the "size", or "cardinality", of a circle? That's a tricky puzzle, because it's hard to know what counts as a right answer. It turns out the right answer is zero. Why? Because the "Euler characteristic" of the circle is zero! Once upon a time, Euler was strolling along one of the bridges of Königsberg. He looked across the river, and noticed that workers were building a bridge to a small island that had previously been unconnected to the rest. He noticed that this reduced the number of isolated islands by one. Of course, anyone could have seen that! But in a burst of genius, Euler went further - he realized this meant a bridge was like a "negative island". And so, he invented the concept of "Euler characteristic". In its simplest form, it's just the number of islands minus the number of bridges. the land has Euler characteristic 2.
the land now has Euler characteristic 1. This makes sense, because the land is now effectively just one island. So, a bridge acts as a "negative island"! the land has Euler characteristic 0. This is sort of weird. But, Euler saw it was a good idea. This reduces the number of bridges by one. We've effectively got one island again, though much bigger now. So, we're back to having Euler characteristic 1. It's all consistent, in its own weird way. 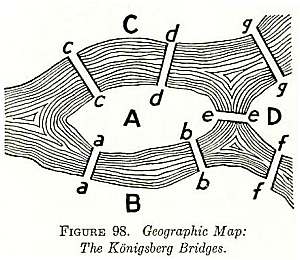 where V is the number of islands (or "vertices"), E is the number of bridges (or "edges") and F is the number of bridges between bridges (or "faces"). By the way, you must have noticed that the number 1 looks like an interval, while the number 0 looks like a circle. But did you notice that the Euler characteristic of the interval is 1, and the Euler characteristic of the circle is 0? I can never make up my mind whether this is a coincidence or not. Anyway, we can easily generalize the Euler characteristic to higher dimensions, and define it as an alternating sum. And that turns out to be important for us now, because it turns out that often when we turn a category into a space, we get something higher-dimensional! I haven't drawn the arrows on my morphisms, due to technical limitations of this medium. More importantly, the triangle is filled with x's, just like Euler's "bridge between bridges", to show that it's solid, not hollow. Simlarly, when we have 3 morphisms laid end to end we get a tetrahedron, and so on. Using these rules, it's not hard to find a category that gives a sphere, or a torus, or an n-holed torus, when you turn it into a space. I'll leave that as a puzzle. In fact, for any manifold, you can find a category that gives you that manifold when you turn it into a space! In fact we can get any space at all this way, up to "weak homotopy equivalence" - whatever that means. So, let's adopt a new principle: whenever our category gives a space whose Euler characteristic is well-defined, we should define the size of our category to be that. Okay. At this point it's time for me to say what Leinster actually did: he came up with a formula that you can use to compute the size of a category, without using any topology. Sometimes it gives divergent answers - which is no shame: after all, some categories are infinitely big. But when it converges, it satisfies all the principles I've mentioned. the reciprocal of the usual cardinality of G.
Some said "it's divergent, so forget it!" But others wisely compromised and said it equals 1/2. This can be justified using "Abel summation". This webpage has transparencies of a talk I gave on this, and lots of links to papers that generalize the concepts of cardinality and Euler characteristic. I'm obsessed with this topic. It's really exciting to think about new ways to extend the simplest concepts of math, like counting. That's why I invented a way to compute the cardinality of a groupoid - a category where every morphism has an inverse, so all the morphisms describe "symmetries". The idea is that the more symmetries an object has, the smaller it is. Applying this to the above example, where our category has one object, and this object has 2 symmetries, one gets 1/2. If this seems strange, try the explanation in "week147". Later James Dolan took this idea, generalized it to a large class of spaces that don't necessarily come from groupoids, and called the result "homotopy cardinality". We wrote a paper about this. What Leinster has done is generalize the idea in another direction: from groupoids to categories. The cool thing is that his generalization matches the Euler characteristic of spaces coming from categories (when that's well-defined, without divergent series) and the homotopy cardinality of spaces coming from groupoids (when that's well-defined). Of course he doesn't call his thing the "size" of a category; he calls it the "Euler characteristic" of a category. Our conversation over coffee was mainly about me trying to understand the formula he used to define this Euler characteristic. One thing I learned is that the "category algebra" idea plays a key role here. It's a simple idea. Given a category X, the category algebra C[X] consists of all formal complex linear combinations of morphisms in X. To define the multiplication in this algebra, it's enough to define the product fg whenever f and g are morphisms in our category. If the composite of f and g is defined, we just let fg be this composite. If it's not, we set fg = 0. Mathematicians seem to be most familiar with the category algebra idea when our category happens to be a group (a category with one object, all of whose morphisms are invertible). Then it's called a "group algebra". when we ignore the directions of the edges. To see what I mean, try item E in "week230", where I sketch how these quiver algebras are related to quantum groups. There's a lot more to say about this, but not today! In combinatorics, category algebras are familiar when our category is a "partially ordered set", or "poset" for short (a category with at most one morphism from any given object to any other). These category algebras are usually called "incidence algebras". In physics, Alain Connes has given a nice explanation of how Heisenberg invented "matrix mechanics" when he was trying to understand how atoms jump from one state to another, emitting and absorbing radiation. In modern language, Heisenberg took a groupoid with n objects, each one isomorphic to each other in a unique way. He called the objects "states" of a quantum system, and he called the morphisms "transitions". Then, he formed its category algebra. The result is the algebra of n × n matrices! Connes has generalized the heck out of Heisenberg's idea, studying the "groupoid algebras" of various groupoids. So, category algebras are all over the place. But for some reason, few people study all these different kinds of category algebra in a unified way - or even realize they're all category algebras! I feel sort of sorry for this neglected concept. That's one reason I was happy to see it plays a role in Leinster's definition of the Euler characteristic for categories. Suppose our category X is finite. Then, we can define an element of the category algebra C[X] which is just the sum of all the morphisms in X. This is called ζ, or the "zeta function" of our category. Sometimes ζ has an inverse, and then this inverse is called μ, or the "Möbius function" of our category. 7) Gian-Carlo Rota, On the foundations of combinatorial theory I: Theory of Möbius Functions, Zeitschrift für Wahrscheinlichkeitstheorie und Verwandte Gebiete 2 (1964), 340-368. These show up when we think of the whole numbers 1,2,3,... as a poset ordered by divisibility. Anyway, Leinster has wisely generalized this terminology to more general categories. And when ζ -1 = μ exists, it's really easy to define his Euler characteristic of the category X. You just write μ as a linear combination of morphisms in your category, and sum all the coefficients in this linear combination! Unfortunately, there are lots of important categories whose zeta function is not invertible: for example, any group other than the trivial group. So, Leinster needs a somewhat more general definition to handle these cases. I don't feel I deeply understand it, but I'll explain it, just for the record. Besides the category algebra C[X], consisting of linear combinations of morphisms in X, there's also a vector space consisting of linear combinations of objects in X. Heisenberg would probably call this "the space of states", and call C[X] the "algebra of observables", since that's what they were in his applications to quantum physics. Let's do that. The algebra of observables has an obvious left action on the vector space of states, where a morphism f: x → y acts on x to give y, and it acts on every other object to give 0. In Heisenberg's example, this is precisely how he let the algebra of observables act on states. The algebra of observables also has an obvious right action on the vector space of states, where f: x → y acts on y to give x, and it acts on every other object to give 0. If ζ has an inverse, our category has both a weighting and a coweighting, since we can solve both these equations to find w and w*. But often there will be a weighting and coweighting even when ζ doesn't have an inverse. When both a weighting and coweighting exist, the sum of the coefficients of w equals the sum of coefficients of w* - and this sum is what Leinster takes as the "Euler characteristic" of the category X! This is a bit subtle, and I don't deeply understand it. But, Leinster proves so many nice theorems about this "Euler characteristic" that it's clearly the right notion of the size of a category - or, with a further generalization he mentions, even an n-category! And, it has nice relationships to other ideas, which are begging to be developed further. We're still just learning to count. Addendum: For more discussion, go to the n-Category Café.